Nothing but chocolate Valentine candy in a cute gift box. You get a Ghiradelli square , York peppermint heart, Russell Stover 1.25 oz heart, Andes Valentine candy , 3 Valentine Hershey kisses and miniature candy bars. If you are looking for a Valentine gift idea for the chocolate lover this is it. With a variety of Valentine chocolates from solid chocolate, peanut butter, mint flavors your Valentine will be delighted. 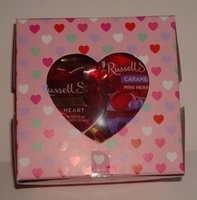 Each Valentine box is 4 1/2" square by 2 3/4" high, with a heart shaped cellophane window. Heart design of boxes may vary then the one shown here, but they are all really cute.